1. Heat a wok or large frying pan. Add oil and stir-fry fennel until starting to turn brown. Add sugar to caramelize slightly. 2. 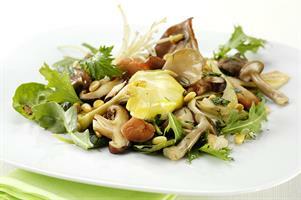 Slice the mushrooms, if necessary, and add to the wok to cook lightly for 2 to 3 minutes. Then add the garlic and pine nuts and stir-fry for 1 minute. Finally scatter the herbs and lemon juice over the cooked vegetables. 3. Serve warm on a bed of mixed salad leaves. To ensure that the mushrooms cook quickly and don’t become overcooked, stir fry the vegetables in two batches and keep the first one warm, covered in foil until ready to serve.